This weekend while I was exploring the Shawangunk Grasslands in Ulster County, New York, with my parents (more on that later) we came across a juvenile Brown-headed Cowbird that was positively begging to be photographed. Actually, it wasn’t begging at all, which is a good thing, as I hate seeing these greedy little monsters begging for food from a bird that is half their size. What am I talking about? Brown-headed Cowbirds are a brood parasite, which means that the female lays her eggs in other birds’ nests, the young cowbirds out compete their foster siblings, and cowbirds are usually the only ones to survive to fledging in the nests that they occupy. It is not an unusual sight to see a Yellow Warbler (or other small species) doing its best to feed a young cowbird that is much bigger than it! 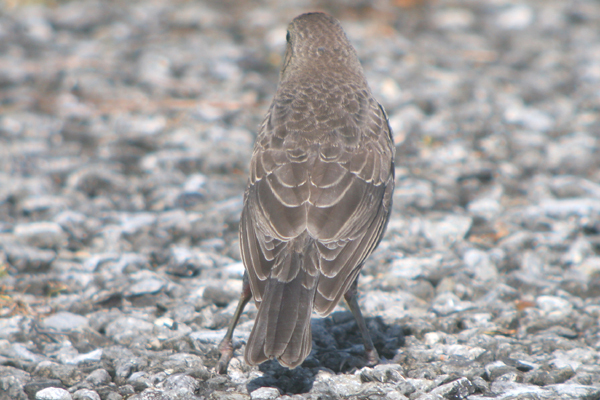 So, when I say that I am glad to see a cowbird not begging what I am really saying is that I am glad that I didn’t have to see some small bird struggling to stuff enough food down a cowbird’s throat to keep it satiated. Anyway, despite the cowbird’s obnoxious survival strategies (and, yes, I am placing a value-judgement on it, if ou have a problem with that, well, tough) this particular youngster looked eminently photogenic in the mid-morning light and it lingered in front of me for long enough for me to be unable to resist taking some shots. Note the pale fringing to the feathers on the back and the fine streaking on the belly: these are sure-fire signs that this bird is a juvenile. Later, if it is a male, it will go through a patchwork-like molt as it acquires its black plumage with the namesake brown head. This post has been submitted to Bird Photography Weekly #48. Go check it out! I wonder if I should start a blog called “The Under-Bird” and write exclusively about Cowbirds, Starlings, Feral Pigeons, Mute Swans and House Sparrows. No hating just because the cowbird mom is smarter than the warbler mom! Nice images of a very cool bird! Yes, I’m passing my own “value-judgement” BUT doing so after considering the cowbird’s lack-of-nesting behavior in context. 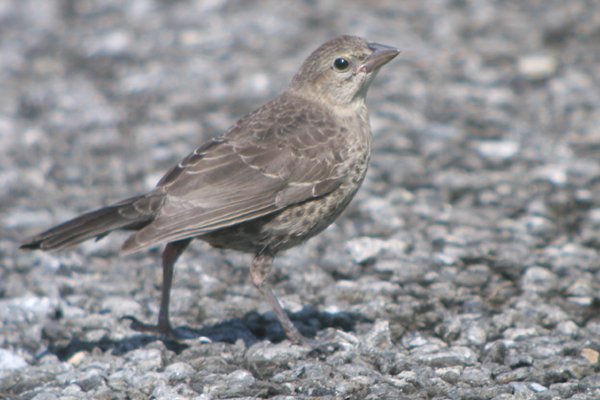 Last year I posted about why I feel the cowbird doesn’t deserve the negativity it gets based on their breeding strategy. It’s not a defense, as it doesn’t need one, but a bigger picture view of their behavior and its effects. Of course, I’m biased because I wrote it, but I think it’s worth a read. Cowbirds are fascinating creatures and beautiful, as your photos show. All the best from the land of Brown-backed Solitaires! @Jochen: That just might be a hit! @Will: You’re not the only one. @noflickster and Rick Wright: Thanks for sharing those links…interesting stuff (but I still am not a fan of cowbirds!). Great pictures as usual. I have seen juvenile cowbirds being fed, and I remember last summer when I saw a yellow warbler with what looked like half its body in another bird’s mouth. My initial reaction was “wow that bird is eating a yellow warbler!” On closer examination I identified the bigger bird as a cowbird that was being fed by the warbler, not eating it. I am a confirmed cowbird apologist. Everyone should check out the Birding article that Rick linked to before passing moral judgement on this interesting bird. Here in Texas hundreds if not thousands of BHCOs are killed every year in the name of protecting Black-capped Vireos and Golden-cheeked Warblers, although BHCO parasitism has never been shown to be a limiting factor in those birds’ populations. We should be focusing our resources on the real limiting factor – loss of habitat! @ Cory – I doubt we can ascribe the human trait of “laziness” to a bird, especially in the context of “survival of the fittest.” Seems to me to be an ingenious way of continuing the species while using fractions of the energy costs other species would use. In a perfect world, maybe they would do it themselves, but I’ve always admired the ingenuity. 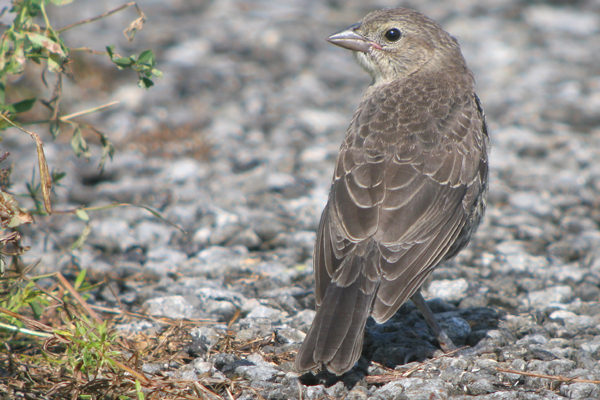 Cowbird control may be useful as a short-term measure for limited-range species, but protecting or restoring adequate habitat is far more important. I remember reading the Birding article when it was originally published and finding it persuasive. 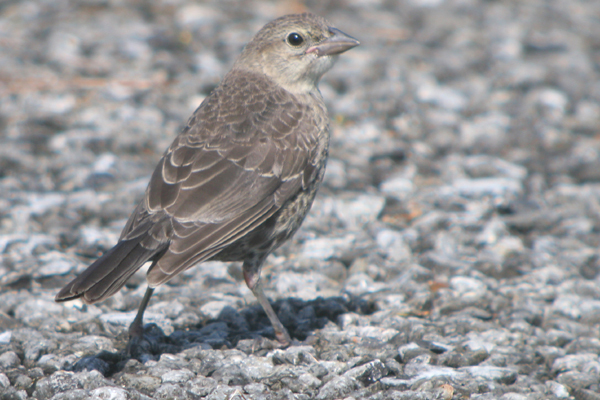 I just saw a few of these cowbird fledglings yesterday. To me they looked kind of comical. Maybe the cowbirds use the photogenicnes you couldn’t resist on Yellow Warblers too. Excellent series on the parasitic Cow Bird. This year, a Song Sparrow was the lucky recipient of an egg in our yard. Last year it was a Chipping Sparrow. Cory….Hey what an informative post. I’m not necessarily an avid birder as you obviously are, but I am a bird lover. And I love getting information from someone who obviously knows as much about it as you do. Very enjoyable. Excellent captures of the Brown-headed Cowbird Corey, no matter what your feelings on the bird are. “Control” of the BHCO seems to be a real controversy but it is much easier to argue that habitat destruction by Homo Sapiens reeking havoc on the planet is much more destructive to bird populations than brood parasites. Thanks Rick and Mike for posting those links. Very interesting arguments!